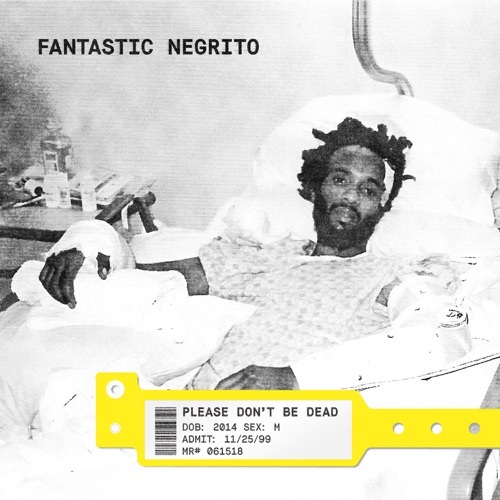 Fantastic Negrito (Xavier Amin Dphrepaulezz) has just released Please Don't Be Dead, and it's a beautiful collection of gritty, warm, blues-and-soul-and-street-inspired California music. California, like the night streets of the East Bay cities and of waiting for Greyhound buses in dusty, suspicious, flourescent-lit, asleep-on-the-floor bus stations, not the California of the Golden Gate or Hollywood. California, like a seven-hour central valley road-trip: see-saw oil pumps to your right, migrant workers bent in drought-thirsty fields to your left, and the empty railroad tracks running parallel to the miraged road: when the daily train passes, it takes forty minutes and no wonder people dodge the gates to cross before the train. California, like desert-hot thirst and cracked, dry reservoirs and a glassful of sweating ice in a dark, midnight bar, not the California of dreams and beautiful-people-on-Venice Beach. Fantastic Negrito's Oakland upbringing and life colour his music, and it's wonderfully atmospheric. I first heard Fantastic Negrito through the theme song to Hand of God, a TV series in the USA starring Ron Perlman, when I had to immediately grab Shazam to find out who was singing. While I'm sure much more of his music will find its way to TV and movies (I see Samuel L Jackson when I listen to Bad Guy Necessary), this album deserves to be part of your collection. It's good. It's very, very good. Fantastic Negrito is currently on tour around the USA and with several upcoming dates in Europe, including Winchester in the UK (at Boomtown Fair). Find Please Don't Be Dead and more of Fantastic Negrito's music here on his website--or through your usual outlet. Take a listen through his YouTube channel, too.